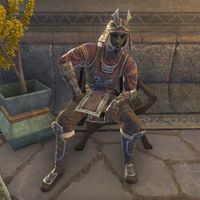 Vadethes Senoril is a Dunmer fighter and member of the Fighters Guild who can be found in Saint Delyn Waistworks in Vivec City. "I served in the House Guard before I decided I needed a new challenge. Now I battle Daedra with the exceptional men and women of the Fighters Guild. I heartily recommend it, in case you're interested." "Vivec may protect these lands, but you know who keeps the rest of the world safe from the likes of Molag Bal? That would be the Fighters Guild! Hoorah!" This page was last modified on 22 November 2017, at 22:49.